^ Britt, Ronda. Universities Report $55 Billion in Science and Engineering R&D Spending for FY 2009; Redesigned Survey to Launch in 2010. National Science Foundation. September 2010 [2010-11-24]. （原始内容存档于2010-10-07）. ^ Johns Hopkins University Nobel Prize Owners. Johns Hopkins Unversity. [27 October 2012]. （原始内容存档于2014年2月8日）. ^ A Brief History of JHU. 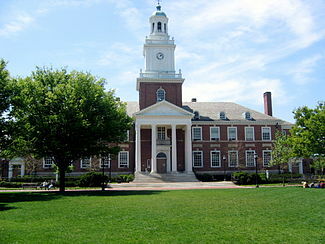 The Johns Hopkins University. （原始内容存档于2008-02-10）. ^ Headlines@Hopkins. Commencement 2001. [2007-02-14]. ^ Johns Hopkins First in R&D Expenditures for 29th Year. Baltimore Business Journal. 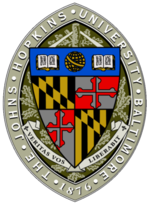 ^ The Johns Hopkins Univesrity: Faculty Honors. Johns Hopkins University. （原始内容存档于2008-09-24）. ^ The Top American Research Universities 2007 Annual Report (PDF). Center of MUP, ASU. （原始内容 (PDF)存档于2015-05-05）. ^ Johns Hopkins Scientists Receive Presidential Medals. Johns Hopkins Medicine Institute. ^ Faculty Scholarly Productivity Index. [2014-04-29]. （原始内容存档于2014-04-29） （英语）.